I feel a bit of a fraud. We struck gold when we moved to this house; the prior owner was a keen grower who left us an embarrassment of riches in the garden. Out front, to the right, is a tiny apple tree marooned in a miniscule wild meadow island. To the left is a rectangular patch of grass, home to three more tiny apple trees. The lawn is slightly wispy round the edges and dotted with remnants of daffodil. Out back – amidst flowers, trees, herbs and grass – stand three raised beds. For me, these were a joy to behold. My husband thought we could afford to lose at least one, but I harboured designs to colour my fingers green. When our daughter was small, I put my name down for an allotment round the corner from where we lived. I loved the idea of growing my own food. So did many others in the area. The allotment was in a popular spot; the wait for a plot was years long. In the meantime, I got a different one elsewhere. It was forty minutes walk away. Up. A. Big. Hill. My husband would drive us there (in a matter of minutes) whenever he could, but the situation was less than ideal. The plot was bigger and thistlier than I could handle. And, with a toddler prone to finding the whole weeding and tilling thing a trifle dull, inconvenient. We got some spuds in the ground. Planted a few courgette seeds (which soon swelled to marrows due to our tardy harvesting). The thistles grew back. The plot thickened. And, less than a year later, it was deemed too untidy for me to stay. It might seem as if the size of the plot is what got to me in the end, but, the truth is, I was overwrought with thought. Somehow, I turned what could’ve been a pleasurable occupation into a back-breaking chore. A complete novice, I’d gathered endless information from multiple gardening books and ended up shovelling shoulds, instead of scooping soil. I thought I’d distilled the various bits of wisdom into what would be the most efficient and productive use of my time, but all I succeeded in doing was stunting my own growth. I’d wanted to plant to the tune of the moon, but my lack of understanding of the basics of biodynamic gardening led me to be rigid in my approach: I can’t plant the carrots, it’s a flower day, not a root day. I must’ve sounded out of my mind. And, in a way, I was. Those pernicious weeds of thought rendered me incapable of simply sowing seeds and allowing nature to take its course. And that, dear Reader, is why I feel a bit of a fraud. Given soil, sun and water, all seeds really want to do is grow into their respective plants. As I looked around today, the beds are teeming with life fulfilling its potential. Around a dozen leafy potato plants (with their delicate lilac and yellow flowers) hint that the gold will soon be ready to dig. 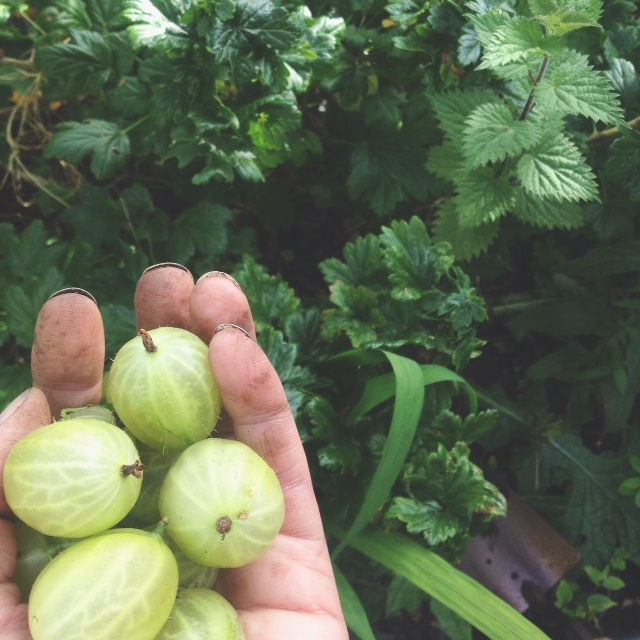 I’ve already harvested a handful each of plump, tart gooseberries and raspberries. The umbrella-leafed rhubarb is tall and pink. One courgette and one cucumber plant have been spared by the slugs (yay!). Tassels of corn sit next to budding beans. And the tomatoes are green. I can’t really claim green fingers—there is little that I have done, save potter about when the mood strikes me and allow myself to get lost in giving the cultivated plants room to breathe. Sometimes I look out the window and something about the picture is A Little Off. I might then notice some tall chancer of a plant crowding in and choking the crops. Whilst I admire the tenacity to cover the ground, the relentless spread, I feel for the plants that are there on purpose. Out I go, armed with my trusty trowel and whip them out. Before I know it, I’ve tended and tidied and talked for longer than expected. My nails are filthy soiled, but my soul is clean. May you grow a luscious garden in your mind this week.